This is one of my favorite times of the year. New Year's Eve is the culmination of a month of good times that starts on Thanksgiving. I get to see my family, as all of our kids come home at one time or another throughout the season. This year my son who lives in Denver came for Thanksgiving and Christmas! But NYE is the cap to the season. Every year, at the end of the season, we do a special celebration for our past guests. 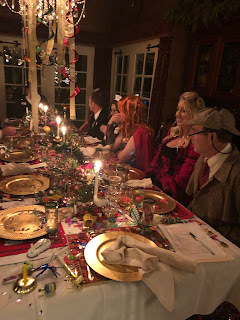 Our annual New Year's Eve Murder Mystery Dinner is a blast! We sell out as soon as we announce the theme, usually in June or July, and the event is only open to guests who have stayed with us before. It's our own little way to say thank you to our guests and a fun exciting way to get to know everyone on a more personal level. We always get to meet new people and love making friends with our guests when the occasion arises. Some of our closest friendships we have forged over the years have come from the insanity that comes on this night! We go all out to decorate the manor for the occasion and spend the whole day preparing the food for the event. All of the guests dress up in costume to match their character, and we offer prizes for different contests, the favorite one being the best costume prize. 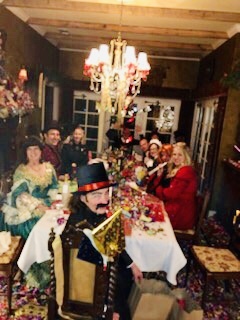 Some of our guests have truly gone all out, with one year that had an American Revolution period theme included a gentleman that stayed in his powdered wig the entire weekend! The food is always fun with a 6-course dinner on the agenda, I love stretching my chef's muscles! 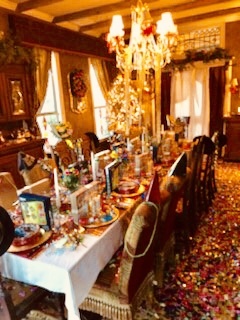 We have the dining room decked out to set the stage for the event of the season. It was so well done that when my son came by to drop off a late-arriving Christmas gift (thank you Amazon! ), he thought there was an actual crime that had happened! We start at 6:30pm after all the guests have had the day to relax, get massages, play with the goats while relaxing with a handcrafted charcuterie delivered to guests, with house-made chevre, asiago, gouda, and Brads smoked meats to set the mood. 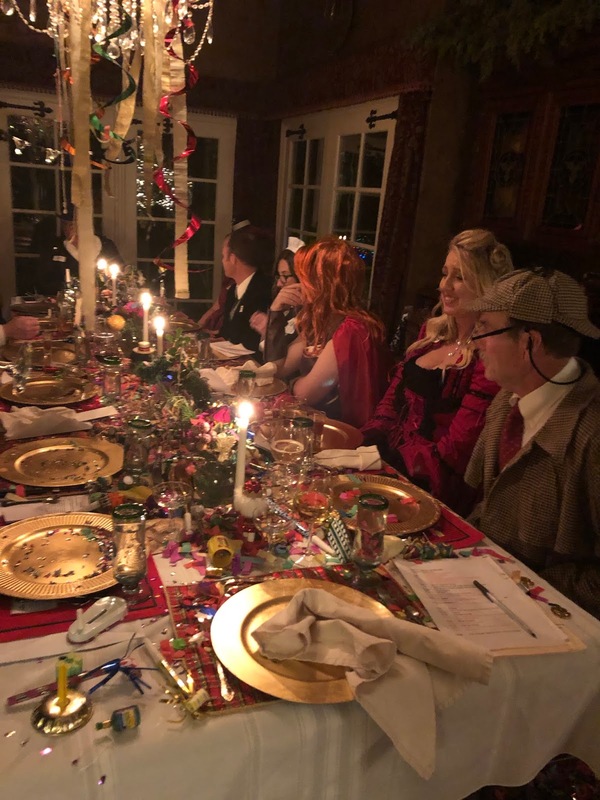 The evening has gone along with all participating in the Murder Mystery as our staff brings both food and clues along the way. Things always get exciting as the free-flowing wine works it's magic and the night progresses. At the culmination of the evening, we all go outside to ring in the New Year with our great fireworks display, a champagne toast, and singing of Auld Lang Syne! Come stay with us for a getaway soon, and then be eligible to join our Murder Mystery, with raucous fun next year!